MWN has been closely monitoring the weather situation for Tuesday night into Wednesday for several days now as a cold front brings a high chance for rain and thunderstorms, and possibly a risk of severe weather. In the 24 hours since our last update, computer models are beginning to come into better agreement, though some slight differences remain, and confidence is starting to increase on our risk of severe weather with this system. On Tuesday, a warm front to our south will lift north towards the metro area. As it does, showers are expected to break out Tuesday afternoon and continue into early Tuesday evening until the warm front lifts north of the area. The threat of severe weather is expected to be very low with this activity and even thunder may be hard to come by. Meanwhile, showers and thunderstorms will be organizing during the evening hours across Arkansas and eastern Oklahoma along and ahead of a slow moving cold front. As this activity progresses east-northeast toward the metro, likely after 9 PM and especially during the overnight, the risk of seeing a few strong to severe storms will begin to increase. As indicated yesterday, the amount of instability that will be in place is in question, but strong wind dynamics will be present. If any strong to severe storms do occur, the most likely threat is damaging winds with a secondary threat of hail. Though the threat for a tornado is not zero, it is unlikely, and would be highly dependent on sufficient levels of instability developing. As of this morning, the Storm Prediction Center put the metro area back under a “Slight Risk” for severe weather for the Tuesday night timeframe. As computer models have slowed the progress of the actual cold front, it appears it will move through the metro sometime around the late morning to early afternoon Wednesday. Thunderstorms are expected to redevelop along the front sometime during this period, and if they develop early enough to affect the metro, another threat for strong to severe storms will exist. Instability levels may be greater during this round, so a more robust threat for damaging winds and large hail could be in the works. The threat for a tornado is unlikely in this round as well. The Storm Prediction Center has the metro area under a “Slight Risk” for this period too. 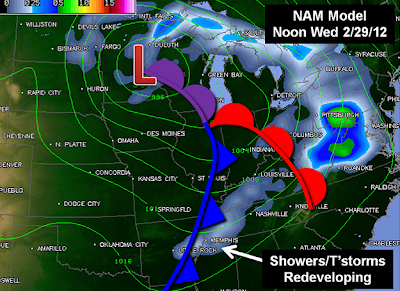 NAM model forecast for noon Wednesday as cold front approaches metro area. The front will pass east of the area Wednesday afternoon, taking the threat of severe weather with it. However, the front won’t be bringing any cooler air to the area. In fact, high temperatures Thursday and Friday will remain in the 70s, which begins the setup for potentially another strong system on Friday, with yet another threat for severe weather possible. Though it’s too early to get into specifics, and shifts in model data are likely in the days ahead, Friday’s severe weather threat could be the more significant of the two. 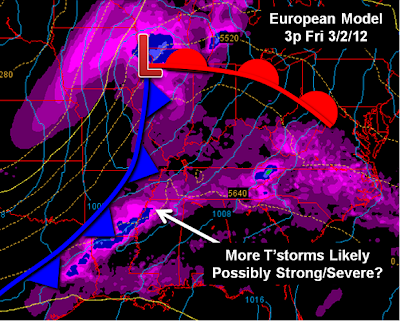 European model forecast for Friday afternoon when another threat for severe weather may develop. 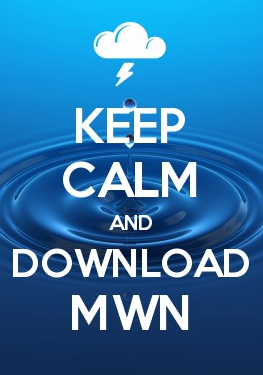 MWN is closely monitoring both severe weather threats in the week ahead and those in the area are urged to stay updated via the methods at the bottom of the post. Once again, we emphasize that now is the time to make sure you are prepared for spring severe weather season, which may be kicking off this week. Be sure to review last week’s blog posts from severe weather awareness week for preparedness tips. Finally, we also HIGHLY encourage you to have multiple methods of receiving notification of severe weather threats, especially overnight. NOAA Weather Radio is one; outdoor warning sirens may NOT wake you up and are not intended to. The other is StormWatch+ - now available in the MemphisWeather.net smartphone apps for Android and iPhone. This mobile alerting technology will send you an audio alert (that will wake you up if your phone is not silenced and it's close by) and push notification if your location is under a watch or warning. It's personalized weather alerting in the palm of your hand! Learn more and download the app at StormWatchPlus.com.